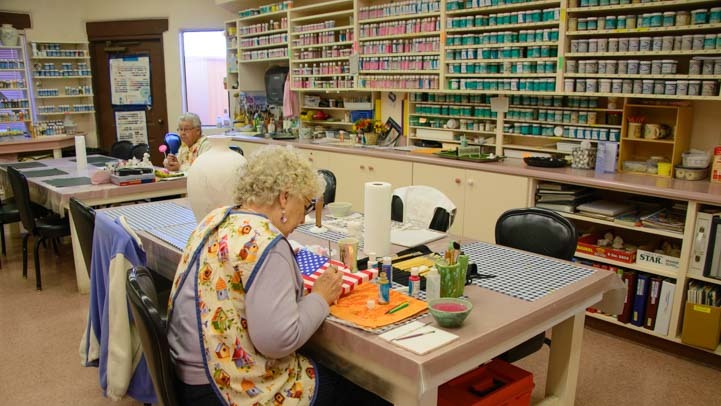 Monte Vista RV Resort in AZ – Arts, Crafts and Sports Fun! December 2015 – By some incredible stroke of good fortune, our traveling lifestyle has given us several opportunities to live at a resort. Most of those places were tropical resorts on Mexico’s Pacific coast that we anchored at as we sailed our boat from the northern border of Mexico to the southern one. 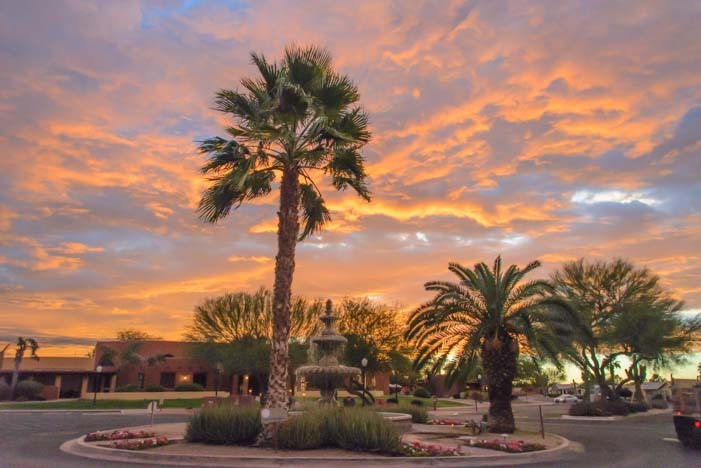 In the weeks leading up to Christmas this year, however, we enjoyed the beautiful resort amenities of Monte Vista RV Resort with our RV in Mesa, Arizona. 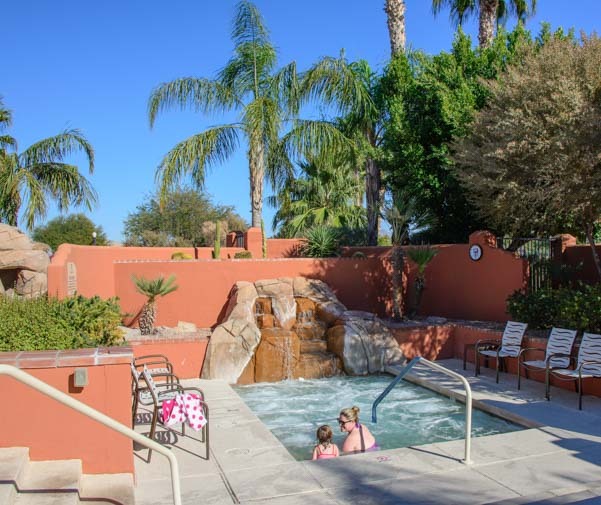 Monte Vista RV Resort boasts true resort style amenities. The first thing we noticed when we arrived was the absolutely gorgeous swimming pool under the palm trees. Lots of people were in the water, and all around the edge of the pool folks were kicked back in lounge chairs sunning themselves. Was this really winter?! What a spot to spend some time! Nearby, we saw a slew of tennis courts, and each one was in use. A tennis instructor was busy teaching a group of women the basics of tennis while their husbands looked on from the bleachers. There were pickleball courts and championship shuffleboard courts as well, but what really caught my eye was the beautifully appointed gym. So often the “gyms” in RV parks are tiny closets with an old treadmill and a few rusty handweights. Not here! Besides a full complement of weight training equipment, free weights, benches and mirrors, in another room across the courtyard there were new and sparkling clean elliptical machines, treadmills and other aerobic exercise machines. But fancy and ritzy amenities only go so far. It is the spirit of a place that makes it fun for a visit, and Monte Vista is a really congenial and friendly community. On our first night, we heard a knock on our trailer door and opened it to find our next door neighbor holding out a gift bag full of homemade baked goodies and wishing us a happy holiday season. We are accustomed to more solitary living in our life on the road, and it was such a heartwarming surprise to be welcomed this way. The next day we found out that twice a week there is an outdoor barbecue called “Lunch With Louie” that is held in the courtyard. 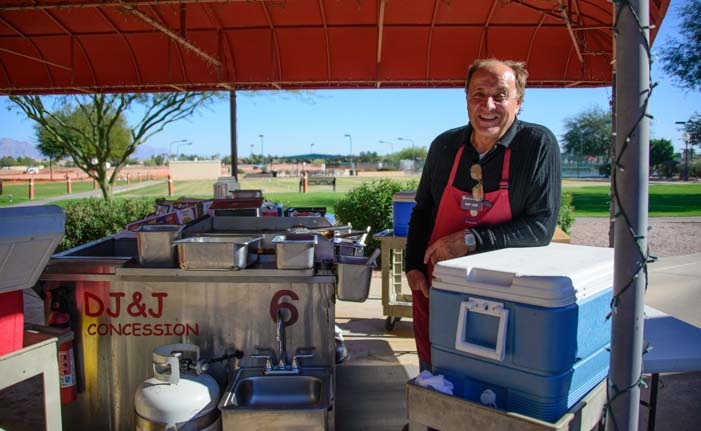 We were amazed when Louie told us he’s been bringing his portable cookout with burgers and hot dogs to Monte Vista RV Resort for 17 years! A few hours later, in the same courtyard, another fellow arrived with a karaoke setup for happy hour under the setting sun. What a hoot that was! 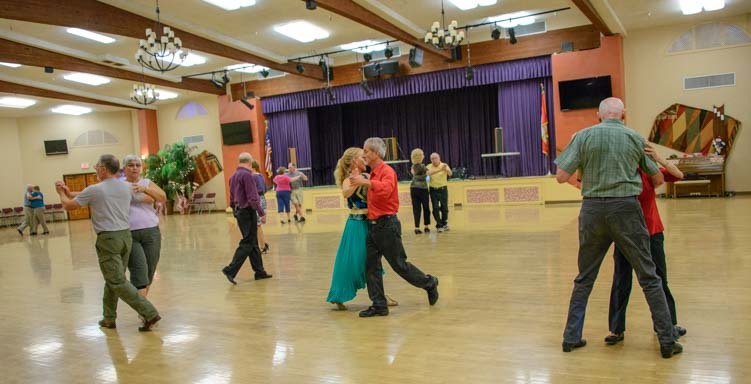 Over in the big ballroom, we poked our heads in the door one evening and found a ballroom Round Dancing class in progress. 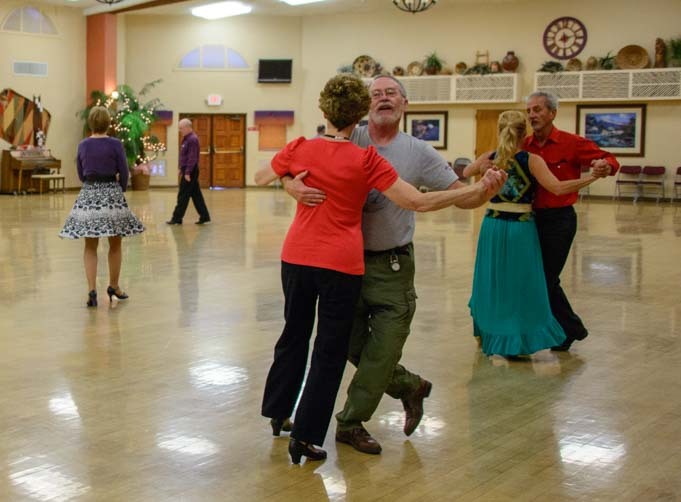 A Round Dancing class in the ballroom! The couple teaching the class elegantly demonstrated the choreographed moves, and then eight or so couples mimicked their steps, gliding across the ballroom floor with fancy footwork. Dance classes are open to everyone that loves music and dancing! There is so much to do at this RV resort that lots of folks stay within the grounds all day long. And no wonder. 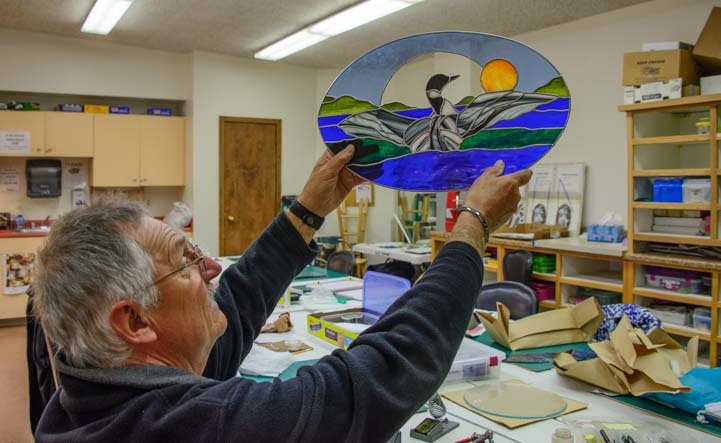 If you have the slightest artistic inclination, there is a some kind of craft available with an incredible studio and good instruction waiting for you at every turn. and the beauty of the work being created! 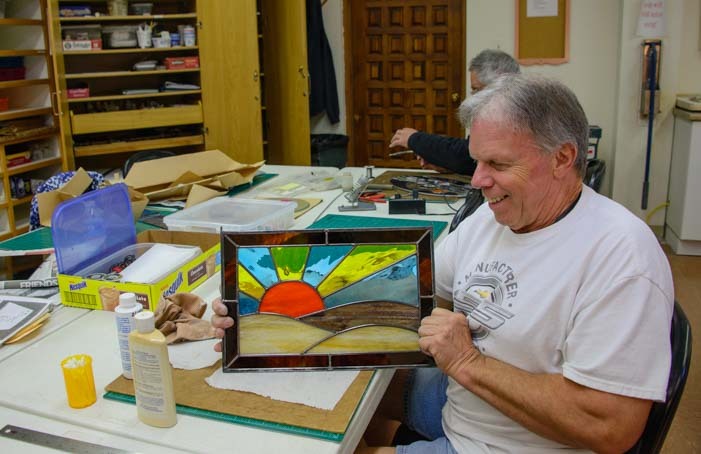 How fun to learn how to make stained glass artwork like this! 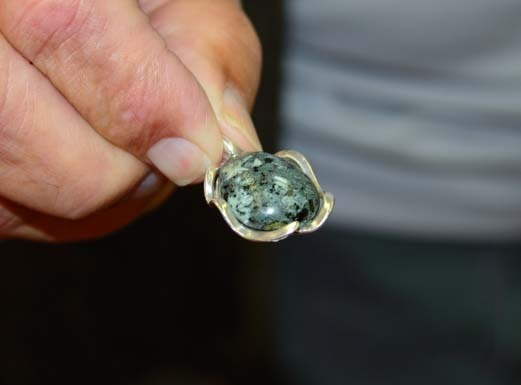 For those that want to make jewelry or cut and polish gemstones, there is a lapidary and a silversmithing studio as well. If you aren’t afraid of using a torch, the silversmithing looks like a lot of fun. 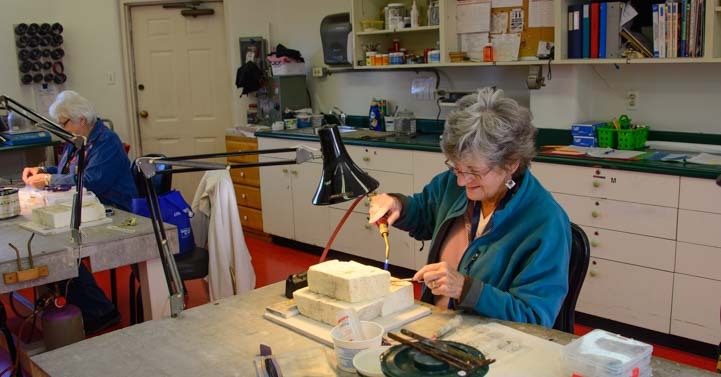 Again, an intro class is given to newcomers regularly, and monitors are available during the copious hours that the studio is open so you can design and make whatever jewelry pieces you wish. One fellow told me he had made so much for his wife that she was decked out head to toe with jewelry all the time. Lucky her! Some folks aren’t into holding a torch or soldering metal. They prefer the enclosed flames of a kiln and the soothing tranquility of making pottery and painting ceramics. For them, there is a pottery studio (learn to throw a pot on a wheel!) and a ceramics studio as well. The ceramics studio has shelves of paints in every color of the rainbow. All this stuff got my creative juices flowing, and like so many visitors who stop in for a week, I began to contemplate sticking around for longer. 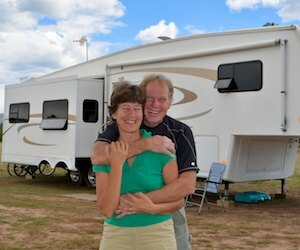 Many of the people in this community are snowbirds who own or rent a park model, but others are full-time or seasonal RVers who want a place to unwind and relax during the cold winter months. Lots of men who have lived in an RV for a while really miss their workshop, garage or down-and-dirty Man Cave back home. Well, the size and variety of the power tools in the wood shop at Monte Vista are probably better than the equipment most guys have in their garage or basement at home! From stump to bowl… how cool to create the transformation! 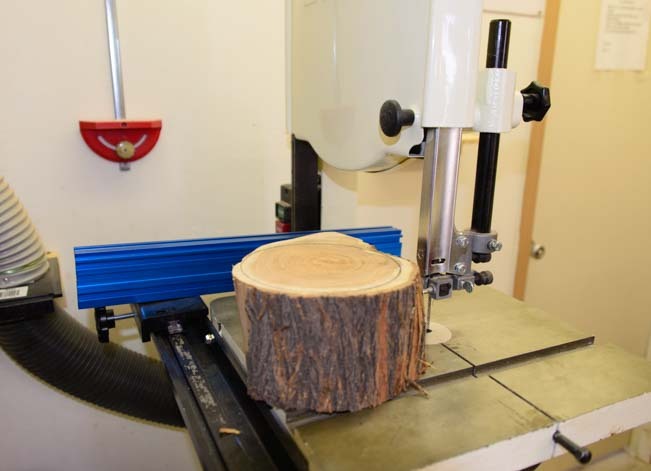 The wood shop has its own building and there are several rooms of power tools and workbenches available for use. The smiles on the faces of the men designing everything from elegant cutting boards to artwork for the walls to larger furniture pieces to wooden bowls gave away the fun they were all having. I was astonished to turn a corner and find a room devoted entirely to lathes. Then I met a fellow who was building a beautiful replica of a carousel merry-go-round. 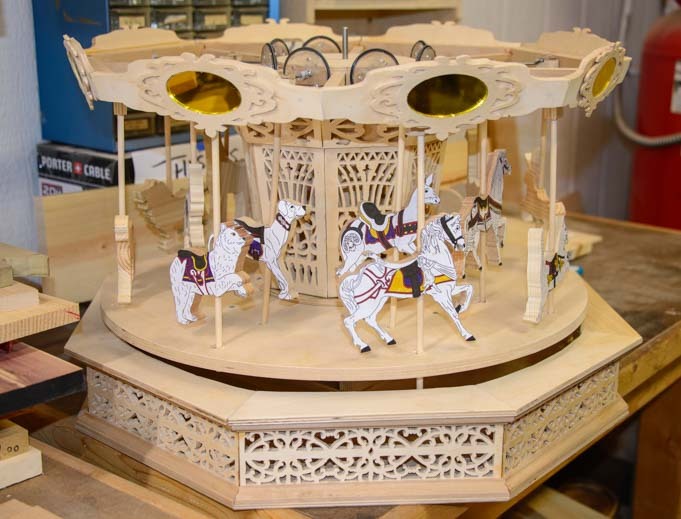 A carousel…what a marvelous work in progress! Every year there is an Annual Spring Expo in the ballroom (March 12th in 2016) where the beautiful works created by Monte Vista’s artisans are put on display for everyone to admire. More than one person told me the quality of the artwork at this expo was superior to that of the professionals that show off their wares at the nearby Fountain Hills Art Fair each winter. Having been to the Fountain Hills Art Fair many times, and now having wandered through the artisan studios at Monte Vista, I would have to agree! It isn’t all specialty artiwork, though. One studio is set aside for a kind of “Art du Jour” freestyle class, and the day I poked my head in the door a group of women was making beautiful Christmas cards to send out to loved ones. Making Christmas cards is fun, but doing it with friends and lots of cool materials is even better. With stencils, doilies, construction paper, scissors, glue and various trimmings, they were enjoying a lively conversation among themselves while reviving the long lost art of handmade Christmas greetings. Not only are there sports and arts and crafts, but the card sharks have their own private, dedicated room as well, with Bridge tables set up just for that purpose. The intriguing thing we found during our stay was how many people we met who had come to Monte Vista for a week or two at first and then returned for a much longer stay the next season. Full-time RVers Larry, an avid woodworker, and Jacquie, who was in a singing group, told us they had stopped in at Monte Vista for a week last winter and were so intrigued by all the activities that they decided to spend a full six months there this year so they could take advantage of everything on offer while at same time resting from their summer travels. This makes a lot of sense. Freestyle wandering around the country is a dream lifestyle, but every so often it feels good to stop for a few months and catch you breath. And what a place to do it! Care for a dip in the hot tub?! We visited Monte Vista RV Resort during the off-season (October-December) and I was surprised at the reasonable rates. It was ~$500/month or ~$300/week. During the peak season of January-March, the rates jumpt to ~$1,000/month, but they drop to off-season prices again in April, a beautiful month in central Arizona. There is an active photography club here too with some really skilled photographers in it. The many fountains in the park are a favorite subject, so we had to try our hand with the fountains too! 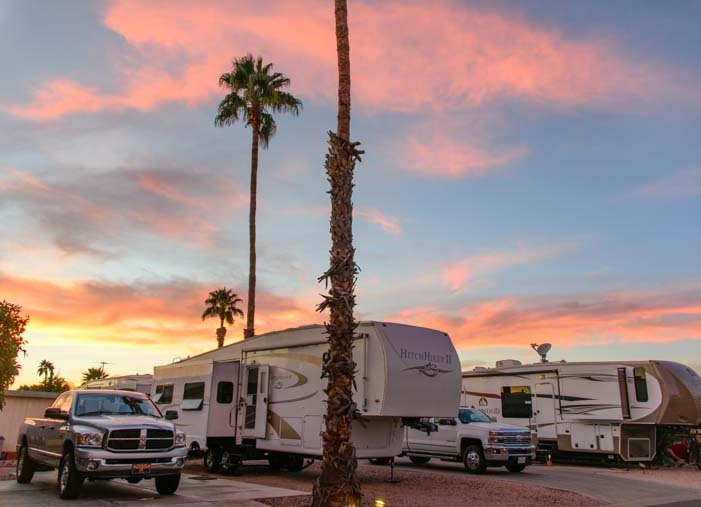 Monte Vista RV Resort is part of both the Encore and the Thousand Trails networks of RV Parks. A ~$550 Thousand Trails annual membership will net a 20% discount on the daily and weekly rates or a 10% discount on the monthly rates. Apply those discounts to any stay, and much of the year’s membership will be paid for, leaving you with 30 free overnight stays within the Thousand Trails network for the rest of the year (and just $3/night after that). That’s a pretty good gig! Our buggy settled in very nicely here! 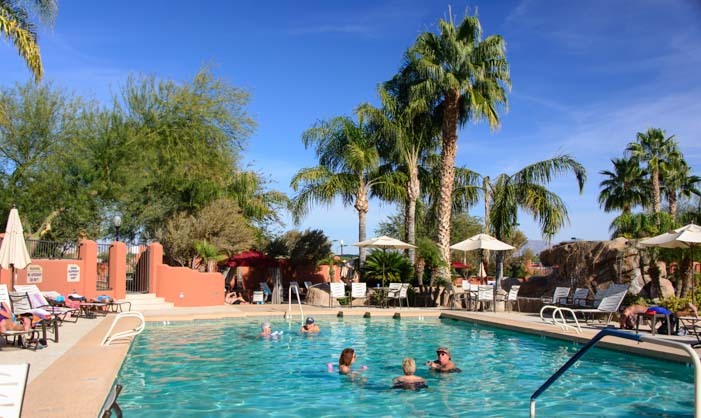 The only caveat about Monte Vista RV Resort is that it is a very popular place. We thought it was hopping during our stay in mid-December, but everyone told us it was actually “slow” at that time because many people had gone home for the holidays! So, if you want to be there when things are in high gear between January and March, be sure to book early! Thousand Trails Membership – Not as expensive as you might think!